For over a decade, there’s been talk of Quentin Tarantino doing a WWII movie. I think I may have originally scoffed at the idea. I couldn’t see how his style would suit a war movie. Then I heard the title of this film he was working on and I thought it was kinda absurd, and would wind up another “Dirty Dozen” knockoff. Turns out it’s inspired by the seldom-seen 1978 Enzo Castellari film, “Inglorious Bastards”, which only Tarantino would know of. At times, he annoys me yet I highly respect him as a writer as well as a walking encyclopedia of cinema. Sure, sometimes his knowledge of film can lend to some almost masturbatory scenes but no other living writer/director can master those scenes as he does. 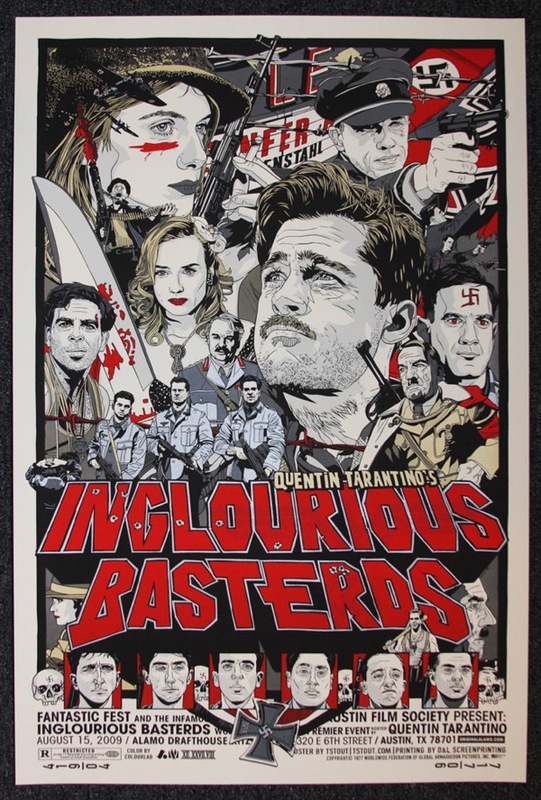 After seeing “Inglorious Basterds”, his beautifully twisted take on 1944 Nazi-occupied France, all I can do is shake my head and smirk at how way off and narrow-minded I was. A hearty helping is in store for those who devour anything Tarantino and for those who truly love film. Prepare to sit and smile during the end credits. I sure did. Amid the bloodshed (not as much as you’d think, folks!) and slow-burn scenes of palpable tension, we’re given several sequences that enraptured the viewer with rich colors and dialogue that demands every iota of attention. This is the WWII of Quentin Tarantino! 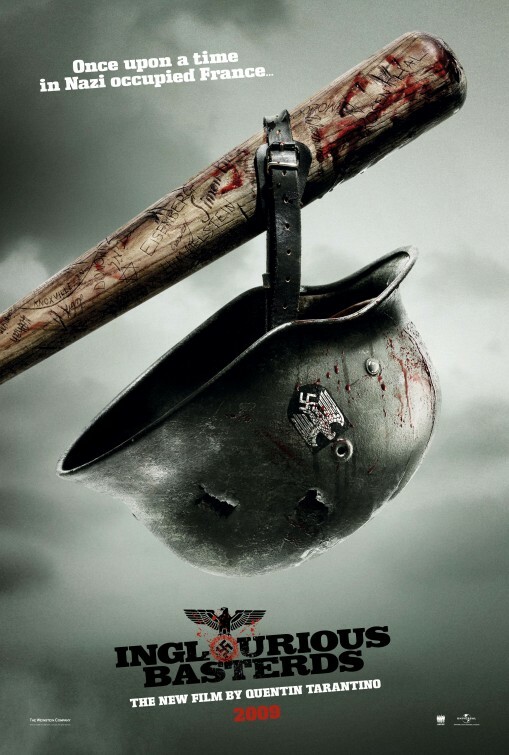 It’s a silly and splendid world where Nazis are scalped with fervor by G.I. Jews, cool and calm dames team up against Germany with smug “basterds” and a British film critic/war hero. While there are aspects of the film that might offend or put off some, it’s important to keep in mind that this is not a history film nor is it a war film. Tarantino doesn’t shoot any famous WWII battle scenes, rather he’s created fictional characters that live and breathe in an alternate WWII reality. It’s also important to keep in mind that this is not a story about the film’s title characters. The “Basterds” are hardly the stars of the film and are best perceived as dark comic threads that weave throughout the other more prominent characters. That may come as a surprise for those expecting a “Brad Pitt film”. It shouldn’t be a surprise for any Tarantino fan that the most compelling drama comes whenever the spotlight shines on the female characters. The entire film takes place in France. As a line in the film states, “directors are appreciated in France,” so there couldn’t be a better locale for scenes with such film noir tension and slow burn energy. 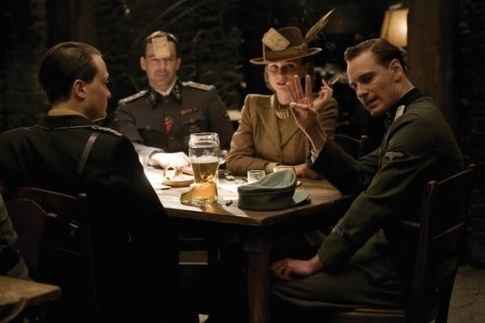 Tarantino breaks down his story into five distinct chapters with the fifth called “The Final Chapter” but first we’re introduced to German Col. Hans Landa (the superb, Christoph Waltz), known as “the Jew Hunter”… He and his men are sifting through the countryside like an eagle looking for rats. This opening chapter amounts to one of the most well-acted and directed openings I have seen in years. It’s a small epic confrontation that immediately establishes Waltz’s Luanda as on to watch. it’s hard not to notice his body language and listen to his choice words and that’s not just because of Tarantino’s great dialogue but also how Waltz chooses to deliver such words. The great thing, is that the viewer knows right away that this will be the first of many great scenes with Waltz. This chapter is also where we meet what will be the film’s main character, Shoshanna (Mélanie Laurent), who escapes from Landa grasp. We later find her assuming an alias and running her aunt’s small cinema with her projectionist boyfriend Marcel (Jacky Ido) in Paris. Her attempt at an isolated life is about to come to an end when a once young Nazi hero turned film star, Fredrick Zollie (Daniel Brühl), annoys his way into her life. He really thinks he’s something as he brazenly arranges to have his film premiere at her cinema. This turns into quite a development for Shoshanna, as she learns Nazi activist, Joseph Goebbels (Sylvester Groth) will be present as well as the top SS brass and even Hitler himself (Martin Wuttke), which provides her the option to end a nation with the strike of a match. At the same time, the allied forces are also monitoring the Nazi activity related to this film premiere and organize what Operation Kino. A former film critic-turned British spy (Michael Fassbender) is assigned to meet up with a German film star (Diane Kruger), working as a double-agent, in order to gain access to the premiere. 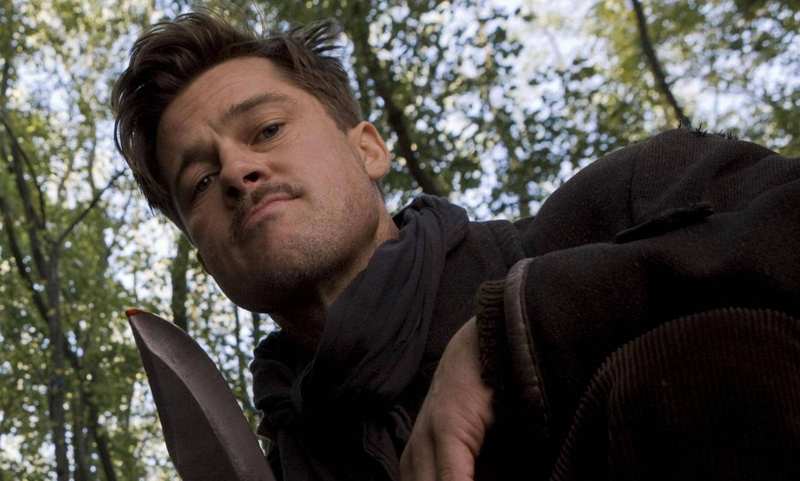 The Basterds, a “Dirty Dozen” band of Jewish-American soldiers led by Lt. Aldo “the Apache” Raine (Brad Pitt) will be assisting both of them in this mission. Aldo is named for his alleged Native American heritage (Tarantino is paying tribute here to character actor Aldo Ray, who often appeared as a tough soldier in many war films) and he demands that his boys give him “one hunnert Natzee” scalps each.. And with Tarantino, you just know he’s gonna deliver on the visual of such a demand. It all comes to a violent and comically irreverent head in the film’s final chapter. Tarantino’s explosive ending may be taken as a history rewrite but as mentioned above this is not a history film. This is Tarantino doing something with The Third Reich that many have thought of doing and wanted to do themselves for some time. He also shows us the racism and barbaric violence that we often find ourselves cheering, causing us to ask ourselves just who the “bad guys” are if the supposed “good guys” actions are just as violent. To successfully do this while blaring David Bowie’s “Cat People (Putting Out Fire)” is genius. It’s no irony that his love for cinema plays a pivotal role here as well, as we see everyone attending Shoshanna’s theatre for the film premiere. This, along with his many visual and musical references to other classic foreign films, make it clear that Tarantino’s love for film is always present. Just as he’s paid tribute to other genres, here he is channeling the likes of Leone and Bertollucci. In fact, with the majority of the film in subtitles, it’s safe to say this is his foreign film. Tarantino always does an excellent job casting his films, but he is to be commended here with this cast. It’s one of the first films where he employs very few well-known actors which, to his benefit, lets the audience concentrate on the characters and their dialogue rather than the actors. Except of course, Pitt, who with his Tennessee mountain drawl and cartoonish delivery may be easy to discount here, but his comic presence is needed to balance out the conflict and hostility that Waltz’s Landa provides. From the moment he appears on screen, Waltz delivers a portrayal of simmering evil as character’s manipulating charm always serves his meticulous attention to detail. He is that chilling antagonist that can make just about anyone uneasy about him which makes it all the more rewarding when he reveals his weaknesses and ultimately, his true colors. As much as it is an absolute joy to watch Waltz work, it is a delight to discover the mesmerizing Mélanie Laurent, as she goes from frenzied desperation to a resolved determination. Like many of Tarantino’s female roles, she has both an attractive vulnerability and an endearing coolness about her. It’s easy to see why she is hounded by Zoller. Out of all the characters, she is the one who we connect with and root for and it will be interesting to see where Laurent, a real find, goes from here. The rest of The Basterds are characterized with broad comic strokes, some not so blatant as Pitt’s Aldo while others like Donny “The Bear Jew” Donowitz (a hammy Eli Roth) are even more over-the-top. The quiet and strange German psychopath, Hugo Stiglitz (Til Schweiger) was wonderful and although Tarantino gave us a quick bio (with vocal narration by Samuel L. Jackson), he also left me wanting more. That narration by Jackson almost has a ripcord effect as does the casting of Mike Myers as British Lt. Archie Hicox which reminds me how Tarantino tends to get in the way of his movies. His dialogue can be a tad too clever or overlong at times, but it usually doesn’t make the film any less for it. It just makes the viewer more aware of these elements, which isn’t necessary what I want a filmmaker doing. Regardless, Tarantino has clearly taken his time building all of those elements that make this a near masterpiece. While his characters are all important pieces of the overall story, he gives each of them enough room to live and breathe. They exist for a reason. As usual, his writing is engaging and electric as is the splendid cinematography by Robert Richardson. It may not be Tarantino’s best film but since I had been underwhelmed by “Death Proof” and some of his other previous work, this is the most delightfully surprising.. Much of that credit is due to Waltz and Laurent but it’s hard to take anything away from Tarantino. As much as his audacious nature remains intact for better or worse, there’s no denying his brilliance.